Making my own sausage is something I've been wanting to try for some time now but I've always felt a bit intimidated by the process. It wasn't until I had the opportunity to spend the day working along side Leighann Smith at Cochon Butcher in New Orleans that I realized there's really nothing to be afraid of. 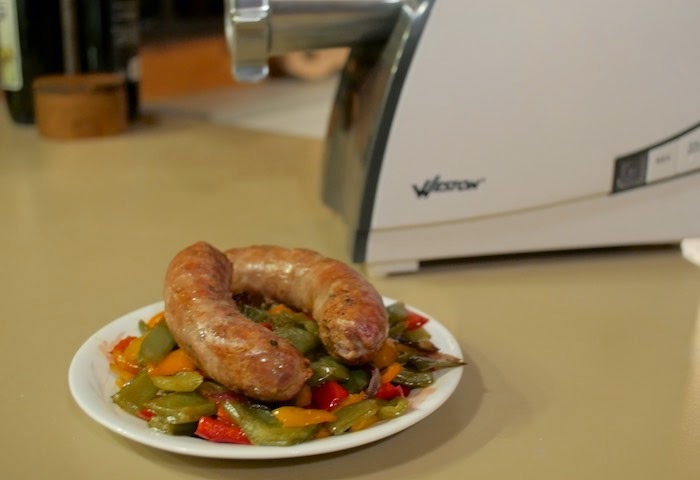 With a good recipe & machine homemade sausage can quickly become a fun routine. After lots of research I decided to try the Weston Heavy Duty #8 Electric meat grinder and sausage stuffer. It's simple to use and the perfect size for the home cook. It has three grinding discs for fine, medium and course grinds, a powerful motor and it is compact and easy to store. I also tried the foot switch and was glad I did, as it makes the machine that much easier to use. The recipe below is slightly adapted from Mario Batali. I added fennel & cut some of the salt. 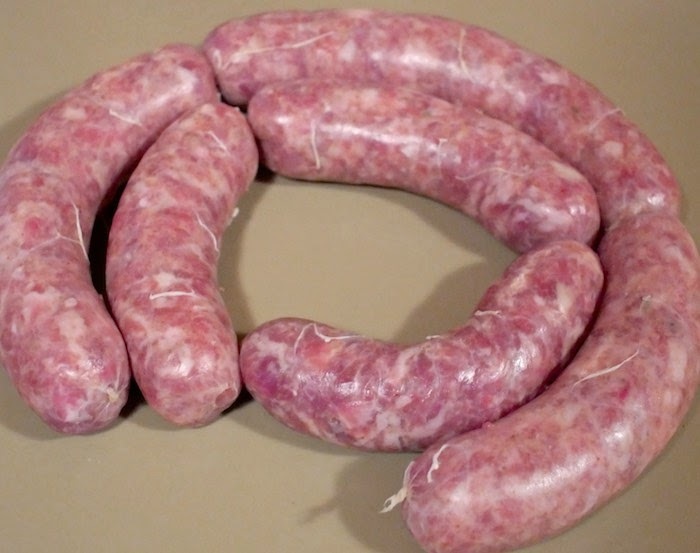 I think it makes a wonderful Italian sausage; perfect for sandwiches, or Sunday gravy. In a mixing bowl, stir together the pork shoulder and pancetta with your hands until well mixed. Add the rest of the ingredients and mix until well blended. Set up the sausage stuffer and place the casing over the funnel feeder. Stuff the sausage into the casings, twisting every 3 1/2 to 4 inches so that each sausage is about 4 ounces. I REMEMBER MY MOM AND DAD MAKING HOMEMADE SAUSAGE PATTIES AND CANNING THEM. I HAVE NEVER MADE SAUSAGE MYSELF BUT WOULD LOVE TO TRY IT. I helped my mother make pork sausage in my childhood. Dad raised a hog every year. My least favorite thing was to help clean the meat for grinding. Yucky to a child! But now I see it differently. I would love to process my own elk and deer sausage this year. I've never made my own sausage but it sounds fun. I could go for some kind of breakfast sausage infused with maple syrup! I have been likewise a bit nervous to venture into this area but I really am curious. Now I want to give it a try. Thanks! Made my own duck sausage using a Hank Shaw recipe. Might have to adjust it to mimic your italian. Looks amazing!! Would love to learn how to make sausage at home. I never have made homemade sausage but I would love to try. We have never attempted it. It would be a cheaper way to eat given the rising prices of meat. My parents did home made Sausage, we never have. I look forward to trying it! it's the only way to get the best tasting meat!! I've never made sausage, but that would change should I win this package. Thanks. I've never tried to make my own sausage, but you've given me inspiration to give it a whirl. I definitely like eating sausage and managing the ingredients yourself sounds like a much better idea than store bought! I've never tried making my own sausage but my hubby has done it and has a meat grinder too. Great giveaway! Many years ago I made cajun sausage and would love to start making it again. I have never made my own sausage, but have been thinking about attempting it recently. Would like to try Italian sausage and breakfast sausage. Yes, I have. It's sort of fun, sort of weird, and always delicious. A grinder like this would make it a LOT easier. Nope- but my Daddy's butcher made the BEST venison sausage in the world! I've craved it for years now. I've always wanted to grind my own meat for sausages but it's always seemed so time consuming and complicated. Italian sauage and bratwurst would be first up on my list to make but I would love to also get really creative with flavors and ingredients. Recently, I've been practicing making homemade sausage and jerky. It's been fun, but, I bet, it would be easier with a meat grinder! I've not made sausage before but it looks like fun! I have not made my own sausage before, but would like to! I have made breakfast sausage a few times but not stuffed in casings. My grandfather was a butcher and used to make sausages. I'd love to give it a try with freshly ground meats. Never tried, but always wanted to, looks good! I have never tried but would love to! I have made sausage several times using my Kitchenaid attachments. I would love a stand alone meat grinder and sausage stuffer. I've wanted to make my own sausage for a long time (and even have a meat grinder! ), but haven't got around to it. It looks as though yours turned out perfectly! I would love to be able to make my own sausage. I have made my own sausage patties but never this type of sausage. I have always wanted to! I've made fresh sausage with good results, but never tried sausage in casings. Looks like fun! NO, but dating an italian makes it tempting to try soon!! Impressive! I've never even dreamed of making sausage...but this recipe sure is tempting. Love the ingredients. I have never made my own sausage before, but have always wanted to try. Making my own sausage is on my bucket list. I sure would like to give it a try. I've never made it at home, but we made sausage in school quite a bit. What an assembly line we had one day! Good for you for making this! Oh, fantastic! I have made my own sausage before, but not since I worked in restaurants (and I've been working from home for almost a decade now). I'd love to have the ability to make some for my family at home. I used to help my Mom, and Grandma make sausage and it was delicious. I've never tried to make my own sausage, but I do find the idea intriguing. It might be a fun project with the kids. A delicious one too! No I have never tried to make it. I remember watching my mom and dad make sausage when I was young. I have never made my own sausage but I really want to give it a try! It looks so great. I've always been too afraid to attempt making my own sausage, but your beautiful results are encouraging me to give it a try! I've never made my own sausage, but I've been interested for awhile. I would LOVE to try my hand at sausage making! Yours looks perfect!! The casings are on beautifully, the color, size and shape...A+ girl! I have made my own sausage patties, but links are way cooler! I'd love to try. I didn't know Italian sausage had wine in it--sounds delicious. I've never made sausage, but husband use to make his own deer sausage when he hunted. Big process, but very good. Homemade sausage is definitely on my bucket list! No, I haven't -- but I think it would be pretty cool! You totally had me at two pounds of pancetta! I've made my own sausage patties, but never sausage links. I bet it would be fun! I made patties but never link sausage. Thanks for the chance! I am interested in your post. This sounds great. Where is top 10 best meat grinder??? I want to make this sausage at home more often.